So it is Halloween and I find myself incredibly nostalgic for childhood trick or treating episodes and the subsequent horror movie marathons with my Dad (even if Halloween fell during the week, we were allowed to stay up as late as we wanted both watching trash and eating candy like it was going out of style.) 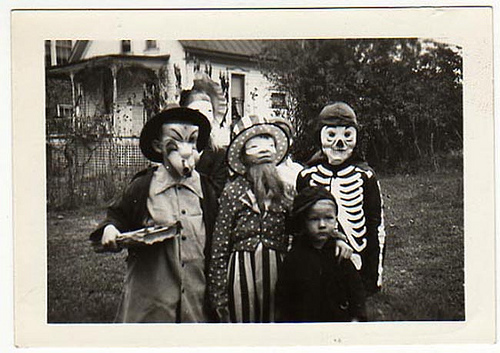 I remember a few costumes, particularly those vinyl tied wrap around costumes with the uncomfortable masks..things like Cinderella and Strawberry Shortcake. In kindegarten I remember I was a devil in red pants & turtleneck with plastic horns and pitchfork. Later I was getting too cool for kiddie costumes and opted for "punk rocker" several years in a row, which basically meant I dressed like an extra from a Motley Crue video and put spray dye in my hair. I don't remember dressing up at all through most of junior high and high school, but did quite a bit in college (the possibility of drunken costume parties seems to have rekindled my creativity). I still do most years as an adult, though, especially since we've started doing Theatre Bizarre every year. Tonight though, I'm library bound, though I have managed to finish up the manuscript of moon poems and send it off into the world in time for the chap deadline I was aiming for. I also managed to get all of the new collages framed and delivered for the next Art of the Library show, which opens in the next couple fo weeks. Yesterday, the waves on the lake were huge and grey and Atlantic-like even inland in wake of the hurricane on the coast, which meant the wind coming in from the water howled all night outside my windows, setting the perfect stage for spookiness.